Don't waste power and weight spinning your wheels! These high performance industrial motors are perfect for powering 10-20 lb competitive robots. They provide excellent power to weight ratios when the total weight of the motor/battery system is considered. Many competitive robot builders use motor and battery combinations that "Overpower" their robot designs. The result is a disproportionate amount of weight is needlessly consumed by the oversized battery packs needed to power current hungry motors. 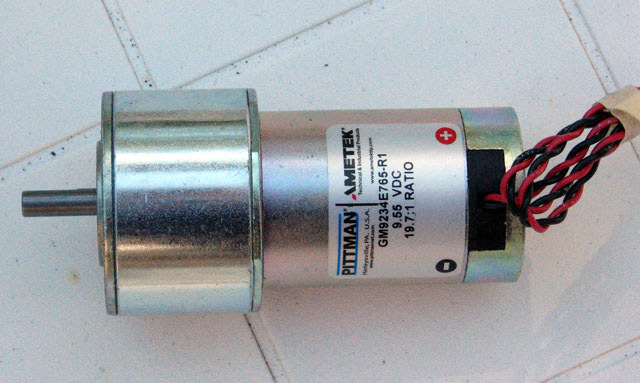 These motors are capable of producing over 100 watts of usable (intermittent) power. The 9.5 volt armature windings coupled to the (500 oz .in.) high torque gear sets are an ideal choice for 15 lb. competition robots. These traction motor systems can be run at 9 to 18 volts. The all steel gear drives are rated at 500 0z-in of continuous torque. The motor shafts are 1/4 inch stainless steel with extra long flats that allow the use of a wide variety of gear, sprocket and pulley options. These motors are designed to accept standard industrial components. 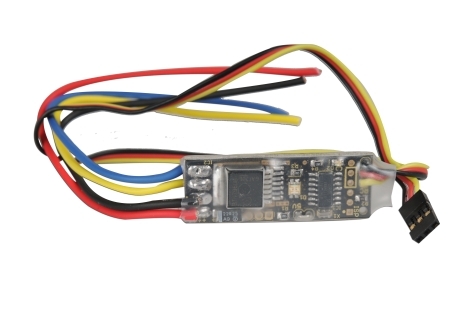 Motor specifications: Overall length: 3.7"
Increasing the applied voltage (electrical pressure) to a fixed magnet brushed DC motor results in higher RPM and higher current through the motor armature; However motor efficiencies drop precipitously. While over-volting a motor is often done to increase performance at the expense of motor life, it is important to remember that heat build up occurs rapidly as motor voltage and current are increased. Therefore it is wise to avoid prolonged run times (over 3-5 minutes) and allow the motors to cool completely between operation cycles. (KT) Torque constant 2.04 ounce inches/ampere or 0.014 Newton meter/ampere. (KE) Back EMF Constant 1.51 Volts/Thousand RPM or *0.0144 Volts/Radian/second. RT Terminal resistance 0.56 Ohms. (INL) No-load current 0.42 amperes (at rated voltage of 15.1 Volts)(With Transmission). (IP) Stall Current 17.0 amperes at 9.5 volts. Quantity discounts available on these gearhead motors. For pricing information, contact our sales department. 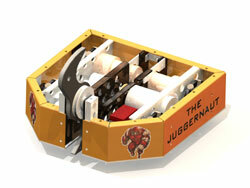 Juggernaut, the Bots IQ National 2007 Solid Works Documentation Award recipient and the 2008, 15 lb College Division Champion, used the GEARS-IDS Competition Motors. View the Juggernaut in action. Note: The GEARS IDS I Electronic Speed Controller and Competition Motor are offered at a special package price. The GEARS Competition Motor and Speed Controller Package offers a robust combination of power, performance and efficiency. 15-lb. competition robots using only a single AA (2000 mahr) 10 cell NiMH battery pack, average 10-minute run times. These highly efficient motors consume less current for a given power output, and thus require smaller battery packs compared to less expensive, amp-hungry, fixed-magnet DC gear motor systems.